On January 13, 2011, Dickinson Ready Mix of Dickinson, N.D., was presented with a 2009 – 2010 “Excellence in Concrete” Gold Star Award. The award recognizes architects, engineers, contractors and producers for accomplishment in concrete design and construction. The award was presented by the North Dakota Ready Mix & Concrete Products Association (NDRMCPA) in conjunction with the North Dakota Chapter, Inc – American Concrete Pavement Association (ACPA). In 2010, Dickinson Ready Mix constructed its new 15,780-square-foot batch plant using LITE-DECK® Tilt panels. The Tilt system allowed the wall and roof panels to be cast on site, using the plant’s concrete and the services of local suppliers while avoiding shipping costs. The Tilt panels were cast on beds of expanded polystyrene (EPS) supplied by Benchmark Foam. The EPS beds were profile cut to form a structural concrete beam in the panel and to insert an attachment rail for interior finishing. LITE-DECK® Tilt panels were used in both the 22-ft tall shop and 51-ft batch plant. The entire complex required 87 roof and wall panels. The Tilt panels varied in thickness from 13 inches in the wall to 24 inches in the roof. Scaling more than 50 foot tall and 12 foot wide, each wall panel weighed approximately 48,000 pounds. The LITE-DECK® Tilt construction created an insulated, minimum maintenance structure with reinforced, pre-cast concrete walls built to last 100+ years. R-Values ranging from R-32 to R-61 will provide lifelong energy savings. 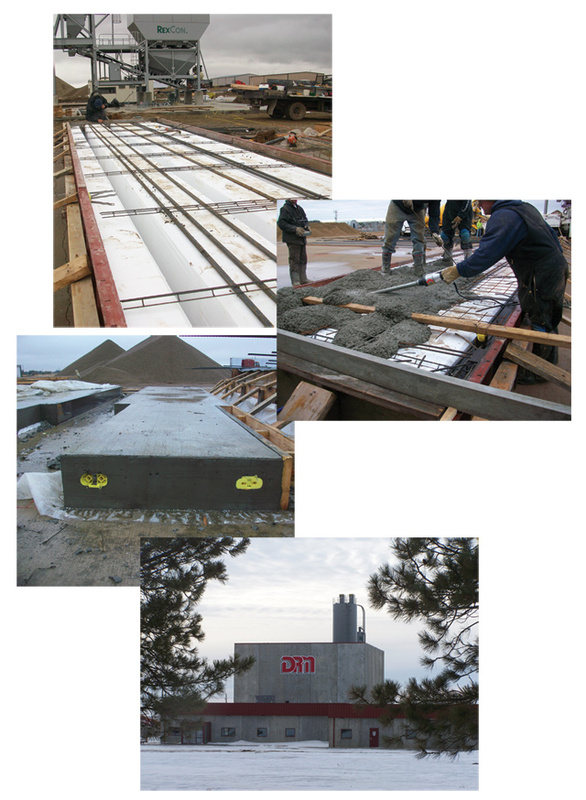 The LITE-DECK® Tilt system, supplied by Benchmark Foam, will assure that Dickinson Ready Mix will be a reliable, efficient supplier of ready mix concrete for years to come. 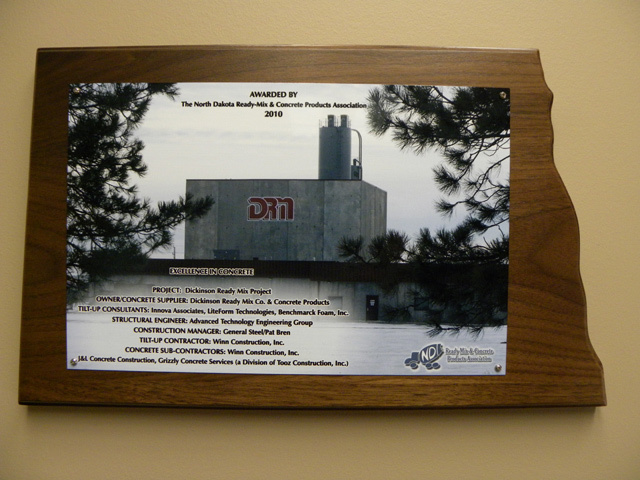 Congratulations to Dickinson Ready Mix on both its new plant and the well-deserved award! Click here to read the full story as published by the NDRMCPA.